The Brewster F2A Buffalo was an American fighter aircraft which saw limited service early in World War II. It was one of the first U.S. World War II monoplanes with an arrestor hook and other modifications for aircraft carriers. The Buffalo won a competition against the Grumman F4F Wildcat in 1939 to become the U.S. Navy's first monoplane fighter aircraft. Although superior to the Grumman F3F biplane it replaced, the Buffalo turned out to be a disappointment. Several nations, including Finland, Belgium, Britain and the Netherlands, ordered the Buffalo. Of all the users, only the Finns seemed to find their Buffalos effective, flying them in combat against early Soviet fighters with excellent results, as opposed to the far more advanced Japanese fighters that the other nations faced. During the Continuation War of 1941–1944, the B-239's (a de-navalized F2A-1) operated by the Finnish Air Force proved capable of engaging and destroying most types of Soviet fighter aircraft operating against Finland at that time, achieving, in the first phase of that conflict, a kill-ratio of 32:1 (32 Soviet aircraft shot down for every B-239 lost) and producing 36 Buffalo "aces". When World War II began in the Pacific in December 1941, Buffalos operated by both British Commonwealth (B-339E) and Dutch (B-339D) air forces in South East Asia suffered severe losses in combat against the Japanese Navy's Mitsubishi A6M Zero and the Japanese Army's Nakajima Ki-43 "Oscar". The British attempted to lighten their Buffalos by removing ammunition and fuel and installing lighter guns to increase performance, but it made little difference. The Buffalo was built in three variants for the U.S. Navy, the F2A-1, F2A-2 and F2A-3. (In foreign service, with lower horsepower engines, these types were designated B-239, B-339, and B-339-23 respectively.) The F2A-3 variant saw action with United States Marine Corps (USMC) squadrons at the Battle of Midway. Shown by the experience of Midway to be no match for the Zero, the F2A-3 was derided by USMC pilots as a "flying coffin." The F2A-3, however, was significantly inferior to the F2A-2 variant used by the Navy before the outbreak of the war. 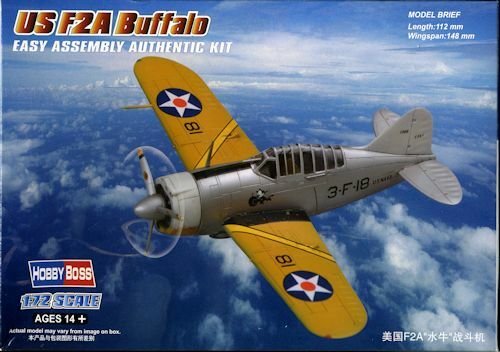 This is the next in Hobby Boss' series of Easy Assemble kits. As such, it is designed to be an introductory kit for newer builders and as such, the series has been quite successful. It provides a lack of complexity and ease of building that one normally expects of snap kits, but it is very much a glue kit despite the tight fit of many parts. The entire wing and lower fuselage are a single piece while the upper fuselage and fin are another. Trapped in between these parts is a simple floor, seat and stick. The instrument panel is provided as a decal. The one-piece canopy fits atop the fuselage with the the tailplanes fitting into large slots in the rear. The cowling is rather oddly flat topped between the guns with engine detail molded in place. Into this fits the prop and spinner assembly. Landing gear are rather sturdy looking, something that is quite different from some Buffalo kits where the main gear is decidedly flimsy. Aside from the cowling shape mentioned, there is no life raft or roll over bar behind the cockpit. Instructions are well drawn and provide paint information from a variety of sources. Despite the kit's simplicity, the camouflage options are not. 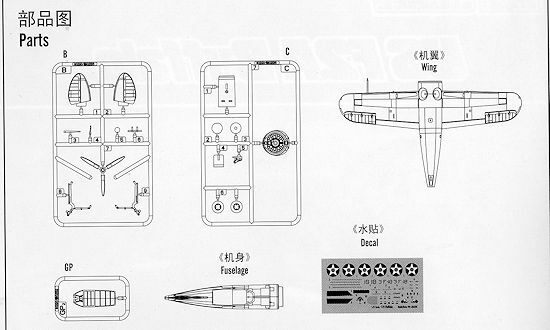 One is the box art plane from VF-3 prior to WWII with yellow wings and a white and yellow cowling. The other is one of the super complex experimental Barclay camouflage schemes applied to two VF-3 planes in early 1940. Below are some photos of the plane provided on the markings sheet. The decals themselves are very nicely printed and they provide the lower landing window as a decal. For those who might be interested in attempting the Barclay camouflage scheme, here is a link that might be helpful:	http://www.jpsmodell.de/dc/schemes/usn_pat2190691_e.htm. I have to tell you that the instructions shows the Navy Blue and Field Grey (what the instructions call for) as being a dark green and brown. TAnother nice addition to the Easy Assembly line and even if the Barclay scheme is beyond the abilities of many, it does provide an interesting option and a nice reference.